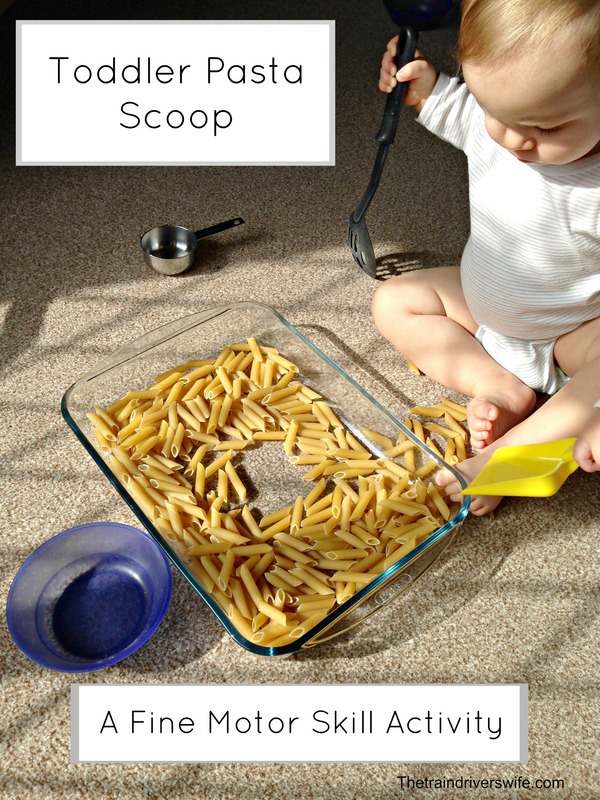 If you haven’t seen our recent scooping activities yet, you can check them out on these links Toddler Raisin Scoop and Toddler Water Ball Scoop. 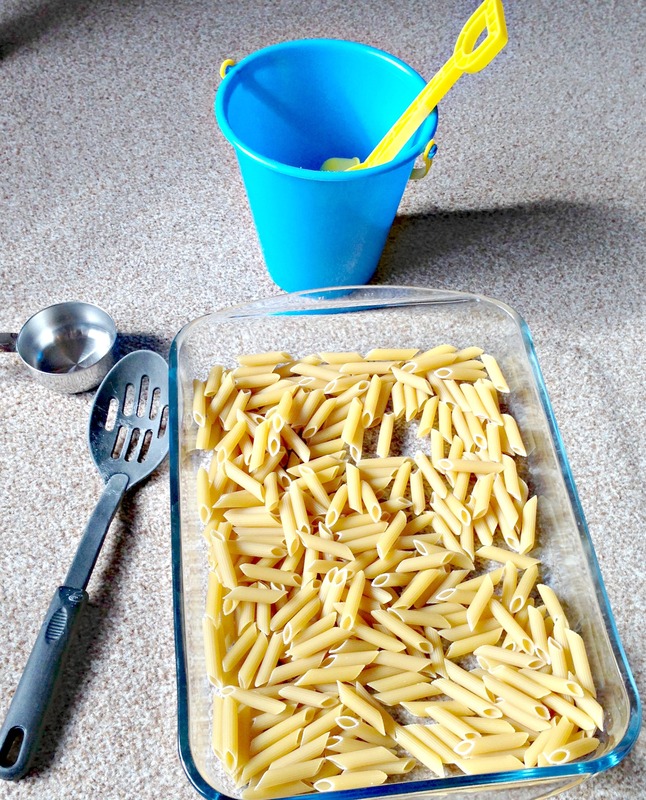 Different objects to scoop with – we used a slotted spoon, a measuring cup and a plastic spade. I set this play up whilst The Train Driver was helping Buddy with his dinner. As soon as he saw the invitation to play, Buddy ran to it. We have been doing so much scooping recently he immediately knew what to do and selected his weapon of choice! It was great to watch Buddy swapping tools and switching his hands too. He also got lots of exercise walking around the tray, climbing over it and running around the room with his bucket and spade in excitement! Buddy really enjoyed this activity and it was super simple to prepare and clean up afterwards. 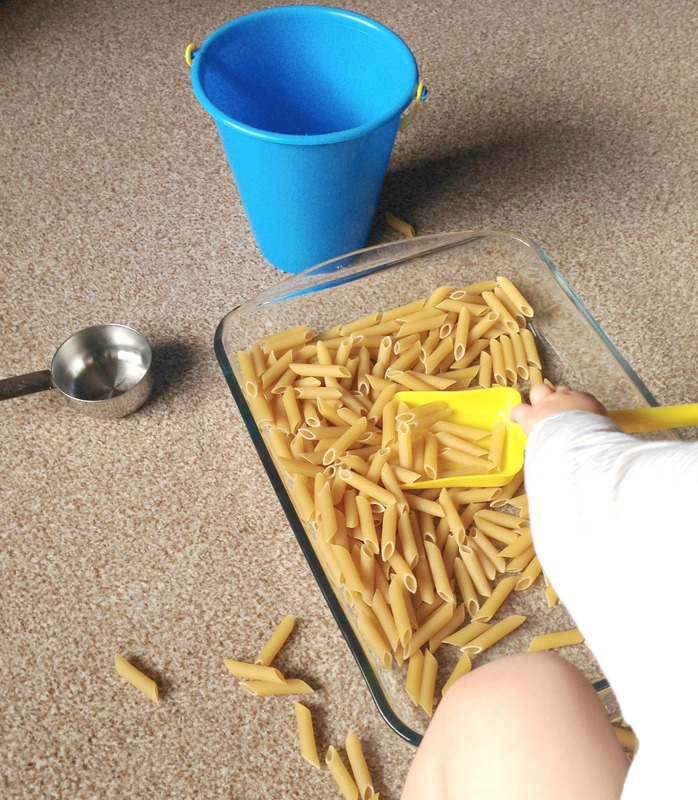 Buddy worked really hard on his fine motor skills here scooping the pasta and keeping the spoon level to drop them into the bucket – great co-ordination practice! 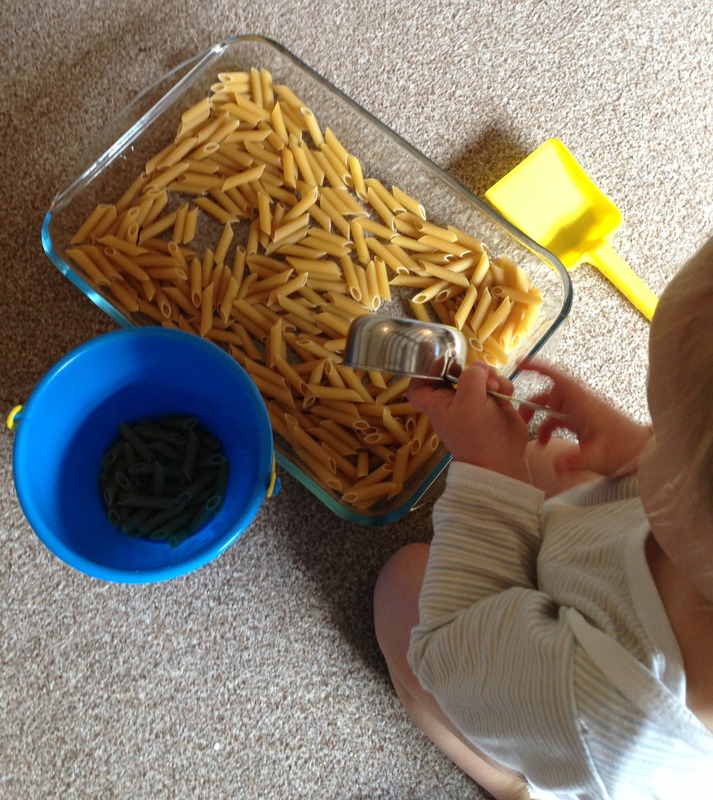 He also worked on his dexterity, holding different spoons and picking up individual pieces of pasta. Buddy is always working on his gross motor skills (this kid never sits still) but during this activity he was practising lots of squatting and moving from sitting to standing in particular. We enjoyed this activity and it kept Buddy occupied for a good 30 minutes. I plan on pulling this out again as one of our Nifty Parenting Hacks to keep Little Hands Busy. If you enjoy No Mess activities such as this, why not check out our No Mess Painting, No Mess Salt Dough Leaf Painting or our No Mess Painting with Toy Capsules. Please let me know what you think of this play, especially if you try it with your little one! I love comments so why not make my day! Little hands do have a habit of getting into everything they shouldn’t! I’m so happy you enjoyed it. Thank you for taking the time to comment! Thank you so much, I’m so pleased you enjoyed it and thanks for taking the time to comment! What a great idea! We let our daughter play with water, but living in an apartment that becomes very wet and messy, pasta is so much smarter to use. I love your pictures too. Thank you so much. 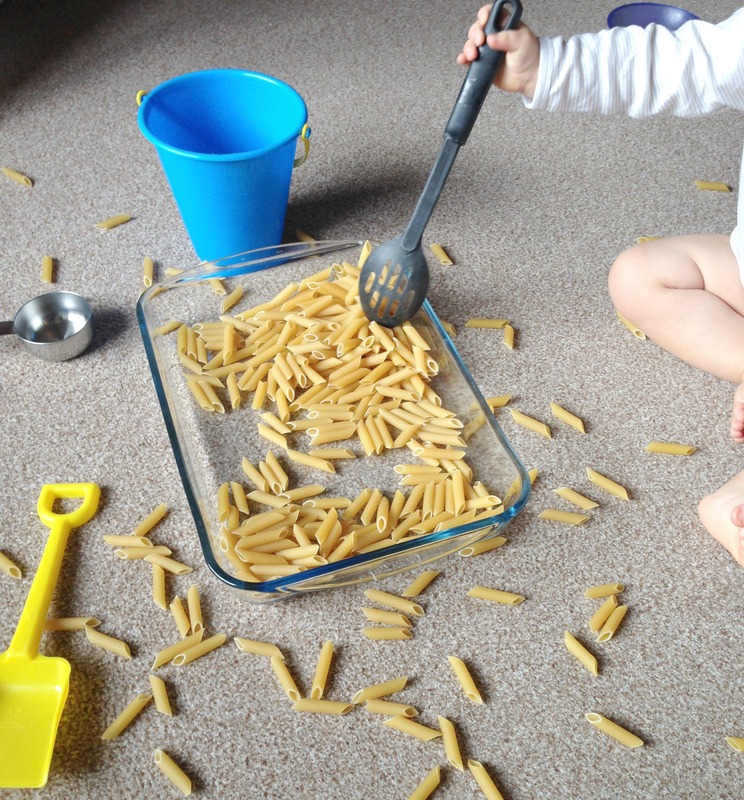 As much as I love messy play, it’s always great to have a no mess or easy clean alternative too! Thanks for taking the time to comment. I’ve set up the spider sensory bin for him to move onto next! Getting so much cooking done!! I’m so glad your son has enjoyed this activity. It remains one of our favourites! We introduced scooping with sensory bins such as this one or our Oats sensory bin. We also practised scooping Raisins with spoons and balls from water. At the time we did this activity I think Buddy was around a year old. He is now almost two and has been able to scoop food (even peas) independently since he was around 15 months old. I hope you enjoy the Spider’s Web Discovery Basket too! Buddy isn’t quite as interested in that one at the minute but I hope his little brother or sister will be! I’m glad you enjoyed it, thanks for stopping by!